Black Hawk College (BHC) can prepare you for a number of careers in Engineering Technology. Because of support from the National Science Foundation, BHC has the latest technology to help you get hands-on, real-world experience. Among the exciting developments at BHC lately are a 3-dimensional U-printer for developing drafting prototypes; a solar panel and a micro-wind turbine hybrid system to light BHC signs. Opportunities for hands-on learning with current technologies prepare our students for any number of careers. Glenn Saddoris, department chair at Black Hawk College, talks about exciting career developments in engineering technology. 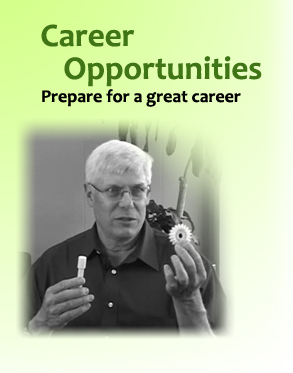 You are currently watching the Career Opportunities video in medium resolution. We also have high resolution and low resolution versions available depending on your internet connection.